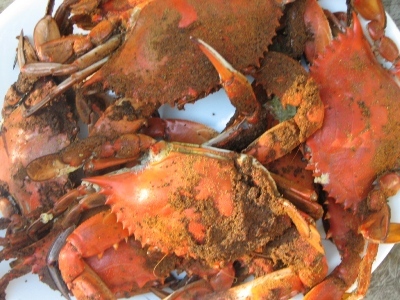 This page includes a selection of traditional Chesapeake Bay seafood recipes including oyster dressing, single fried oysters, steamed clams, clam fritters, and fish chowder. Preheat oven to 325 degrees F. Drain oysters, reserve liquor. Remove any shell and chop oysters. Combine oysters, cooked vegetables, bread cubes and seasonings in a large bowl; mix thoroughly. Rinse oysters in their own juice. Serve immediately with small rolls, ketchup and mustard or just enjoy oysters alone. This recipe is flexible. Depending on size, 24-36 clams will feed 2 adults. The most important factor is having the correct amount of water in the steamer. Add about 2 cups of water or beer, or enough to be 3/4 inch deep in the steamer. Boil on high heat about 5 minutes or until the steam rolls out when the lid is opened slightly. Add clams and an additional cup or so of water and cover, heating on medium heat. Steam clams about 5-10 minutes, or until the majority of the shells are open. Do not overcook. Shuck the clams, catching the juice in the bowl. You should end up with a pint of clams or more. Rinse the clams in their own juice. Use scissors and remove stomachs from the clams. The remaining parts of the clams may be cut up into small pieces with scissors or chopped in a food processor. Add the clams, egg, baking powder, about 2 tablespoons of milk and mix. Blend in the breader mix or seasoned flour and stir until the batter becomes thick like pancake batter. Serve immediately on hamburger buns with ketchup and mustard or just eat them as is. Mix eggs, mayo mustard, seasonings and Worcestershire sauce. Blend in crab meat and bread crumbs. Form into cakes and place on a platter lined with wax paper. Chill crab cakes for 30-60 minutes before cooking for best results. Shake crabs and breader mix in a plastic bag. Saute soft crabs in peanut oil with high heat until brown, turning once. Rinse fillets and cut into small pieces. Pare potatoes, cut into small pieces and boil 5 minutes. Add sliced onion and fish. Cook until fish is done, about 20 minutes. Add milk, water, butter salt and pepper. Simmer a few minutes and serve hot.